Every case is different. And every lawyer is different. For that matter, no two clients, judges, or juries are alike, either. Consequently, accurately predicting the outcome of a case is impossible (and unethical in certain circumstances). However, because experienced attorneys have had experience with particular laws, fact patterns, attorneys, opposing parties, and judges, it is usually not a difficult matter for an attorney to provide a reasonable estimate that includes a range of possible (maybe even probable) outcomes. Every litigation case, including personal injury cases, can be split into three different categories, each of which must weigh positively in favor of the plaintiff before I will agree to take the case. I make it a practice of explaining these categories to potential clients and applying the facts of their case to all three so they know going in how strong their case is, and if I decide not to take it, they understand the reason. These three categories are liability, damages, and collectibility. Liability refers to the legal means through which we can hold someone accountable, or responsible, for their actions (or inactions). In civil cases, the ultimate goal is almost always to obtain (or in the case of the defendant, keep plaintiff from obtaining) a money judgment. Before a court can compel a defendant to pay anything to the plaintiff, the plaintiff must first prove that the defendant has done something wrong (including failing to do something the defendant should have done). Thus, to make a preliminary assessment of liability, the attorney should understand which law, rule, contract provision, regulation, industry standard, etc. has been breached, violated, and or ignored. In a breach of contract case, for example, the first thing an attorney will want to review is the actual language of the contract. In a defamation case, the published false statement will be of paramount importance. Negligence attorneys look for a duty that has been breached. Making a liability assessment is best left to an attorney, as an attorney will be familiar with the elements of each respective claim that must be proven for a plaintiff to prevail, and will thus be best equipped to ask the right questions to accurately be able to apply the law to the facts. For example, in a defamation case, an attorney will know that only false statements of fact are actionable, not expressions of opinions. However, just because the word “opinion” is used in the statement does not make it so. Contract attorneys will know that just because it is an adhesion contract (i.e. a take-it-or-leave-it contract not open for negotiations) does not make it unenforceable. If the facts are such that the defendant’s liability is likely, then the plaintiff could probably obtain a judgment should the case go to trial. However, that is not the end of the analysis. Most claims have damages as an element. Breach of contract, negligence, defamation, and fraud, for example, must have resulted in some type of injury, harm, or loss to the plaintiff or there is no claim. These damages can take many forms. Economic damages, or those damages that can be calculated, are recoverable from the defendant if they result from the defendant’s wrongdoing. Examples of economic damages include medical bills, lost wages, prescription costs, lost opportunities, and any of a number of other losses. Noneconomic damages are those that are more difficult to calculate—they don’t come with a receipt. For example, disfigurement, like scarring or a missing limb, represent losses that aren’t out of pocket. Pain and suffering is another kind of noneconomic damage that a liable defendant must compensate a plaintiff for. Because noneconomic damages are impossible to definitively calculate, they end up being worth whatever the attorney can convince either the opposing party (in settlement) or the judge or jury (at trial) that they are worth. Not all claims include damages as an element of proof. Battery, for example, or an intentional offensive or harmful physical contact without consent, is actionable even if little or no actual damage resulted. But battery, like other intentional torts, opens up the possibility of punitive damages, which requires the defendant pay not to compensate the victim, but as a punishment meant to deter the defendants and others from engaging in similar behavior. Whether damages is an element of the claim or not, as a practical matter, there must be some justification for a sizable award or litigation becomes prohibitively expensive to pursue. Establishing liability and damages will not matter if the resulting judgment is not collectible. If a plaintiff prevails either through strong negotiations or by means of a trial, but the defendant either does not have the means to pay or files bankruptcy and is allowed to avoid paying, then all the time and effort required to get a settlement or judgment would have been for naught. Thus, attorneys analyzing the value of a case will want to find out if there is adequate insurance coverage or a defendant with deep pockets, usually a big business or large corporation. Although wealthy individuals can sometimes also be able to pay a judgment, usually these are the same people savvy enough to protect their assets through estate planning. Good cases usually have liability, damages, and collectibility all present in some significant measure. A case with strong liability and damages is as worthless as the piece of paper the judgment is written on if the judgment is not collectible. If you’ve been injured in a car accident by an uninsured but at-fault driver, liability can be clear and damages can be high, but most attorneys will probably still turn down your case unless there is some evidence that the uninsured driver has the means to pay for the damages. In those cases, you’re left footing the bill unless you had the foresight to pay for uninsured motorist insurance (UIM coverage). Finally, if the damages are high, and the defendant has the ability to pay, but the liability is not there, then there is nothing an attorney can (ethically) do. This might be the scenario where you are injured badly in an accident, the other driver has good insurance, but it was your fault. The law will not hold others accountable for your injuries unless they have some reason to be. Insurance companies have contractual reasons to reimburse others, and tortfeasors (those who commit actionable wrongs not related to contracts) have common-law and statutory reasons to reimburse others. If you are the victim of someone else’s actions—be it arising from contract or the law—a simple analysis by an attorney of the facts of your case as they compare to civil law will give you an idea whether you have a good case. 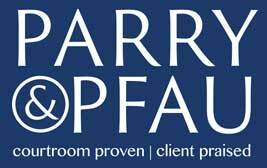 If in doubt, call Parry & Pfau to set up a free consultation with a knowledgeable attorney. Older PostAre Oral Contracts Enforceable?